For centuries there has been an “upper” Orbe and a “lower” Orbe. Intuitively the inhabitants of this part of the Jura felt there had to be an underground connection between the Vallée de Joux and Vallorbe. The “upper Orbe” rises in France from the Lac des Rousses and then winds lazily (“orb” = curve, circle, orbit) before running into the Lac de Joux. The Vallée de Joux is in fact one of the most perfect “closed” catchment basins one can find in Central Europe. The depression which forms it was created by the folds of the Jura when the chain of the Risoux and the Mont Tendre were formed. At the end of the Vallée de Joux (Le Pont) another major geological feature intervenes. A huge North-South fault (or fall) placed a whole mountain (the Dent de Vaulion) across the Valley, in effect creating a natural dam. We can easily understand how the lakes, or glaciers (during the Ice Ages) were formed and survived. We can imagine how the waters would have filled the whole valley before flowing over the little pass of Pierre à Punex between le Pont and Vallorbe were it not for the deeply fissured and porous limestone rocks which border the Lac de Joux and the Lac Brenet and which can channel vast quantities of water into their depths. Thus many “swallow holes” or leakages (Bonport, Rocheray, Moulin etc) fulfilled this function, before any human intervention. Then about 100 years ago it was decided to excavate an artificial outlet in the direction of Vallorbe, to achieve better control of water levels. Later this fall of water was used to generate electricity (the Power Station of La Dernier). The “swallow holes” or dolines were also “improved” in order to control leakages. 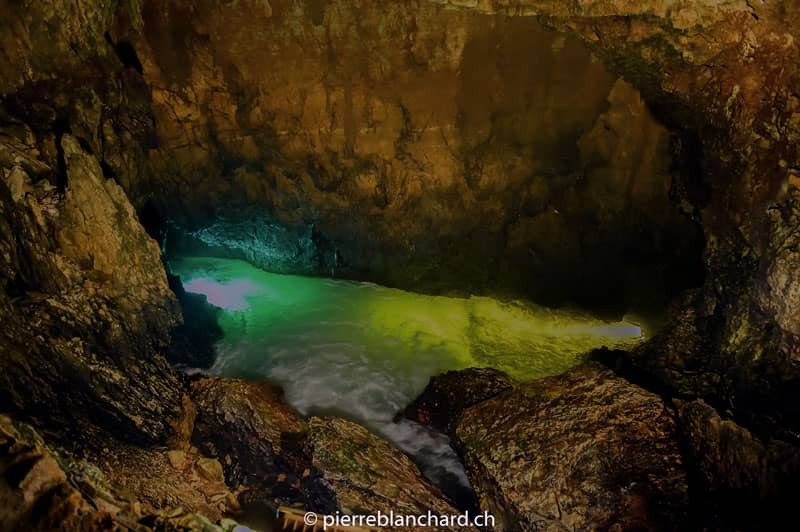 Today the basic rate of flow of the Lower Orbe which breaks forth at the source is maintained by underground drainage in relation to much greater surface areas (the slopes of the Mont Tendre and the Risoux etc. The flow of this truly underground water, which is the direct product of the train and snow falling on the flanks of those massifs, following approximately the same course as the surface waters, but several hundred meters lower! Thus in effect two Orbes – one above the other – coexist in the region of the Vallée de Joux. One can imagine the underground Orbe running – probably violently – through the vast galleries evolving beneath the Lac de Joux. Frequently – and erroneously – characterised as a “Vauclusian eruption” the source of the Orbe and its first “sump” or submerged gallery are in fact caused by a simple build-up of moraines (from glaciers) and of scree or rubble accumulated at the base of the valley and thus blocked the lower part of the gallery, forcing the water to rise; – nothing to do with the famous Vaucluse Fountain, the waters of which rise from a submerged “karst” formed at a depth of 300 meters. Today’s visitor, who may not wish to follow this submerged route to the cave, can use an artificial tunnel which leads directly to the “Lac du Cairn”. From here the re-discovered river Orbe falls a dozen metres or more. Underwater lighting shows that this large submerged cavity is particularly calm. The contrast is very striking when one considers the turbulence of the water before and after this sump. The flow is about two cubic metres per second low water, but can rise to eighty cubic metres per second in periods of full flood (February 1990). The water temperature varies according to the conditions of the lakes on the surface, and can vary from four to thirteen degrees (C). The air temperature in the caves is around ten degrees C throughout the year, and the humidity approaches 100%. The carbon dioxide content of the air is around 0.3% or about 10% higher than the outside atmosphere. This presents absolutely no risk or discomfort to the visitor. Upstream from the first sump the river runs freely, as it does on the outside, through enormous blocks of stone which have fallen from the vault. Going more than 200 metres back up the flow the cavers were able to discover a new working sump: the “Siphon des Marmites” (Marmite = “cooking pot”) (cf map). This passage is only passable when the flow of the river is low because the “Gallery of the Half-drowned” is very narrow in places. Before arriving at the “Siphon des Marmites” one sees an enormous redundant gallery running six hundred metres in the direction of Vallorbe. This great branch tunnel is an ancient course of the Orbe, from when the river emerged much higher, near to the shooting range (!). This section of the caves is richly concretised, especially in the “Salle des Aiguilles” (= “The Chamber of Needles“) where thousands of stalactites hang in serried ranks. Access to sections upstream from the main caves,Access to sections upstream from the main caves, towards the Vallée de Joux, requires leaving the developed section and going back up the “Grande Salle” (The Great Chamber). The imposing size of this chamber has been formed by falls of great blocks of stone from the walls and roof.This place was blessed when a major fracture or rift created this underground Cathedral. As for the internal decorations, nothing is missing; Imposing stalactites on the left hang from the roof while on the right ripples an immense flow of calcite and “moon milk”, followed by a “rain” of translucent threads while a regiment of “plate pile” stalagmites rise from the floor. At the far end of the “Grande Salle” a superb accumulation of disc-shaped stones are spread over the floor making a natural “Roman Road”. Here we are at one of the great cross-roads of the caves. By following the direction of the Grand Salle we can rejoin the Orbe as it runs between the “Siphon des Marmites” and the “Siphon de la Baignoire” (the Bathtub Sump). To the right, after scaling a fifteen-metre slope, one reaches the start of a large, partly accessible gallery which is the key to further exploration. It is to be observed that at times of very high water this gallery fills up completely and that a significant waterfall flows into the Grand Salle. The rest of the caves are rather more austere since – apart from the Fossil Gallery, which enables the Sump of Block No. 1 to be avoided, and ends at the Sump of Block No 2 – the going is fairly uniform and only partly concretised. The water becomes “aggressive” when its acidity rises as it reacts with vegetation and above all as it flows over surface layers of soil (humus, micro-organisms &c). Then as it pervades the calciferous massif through the many fissures and cracks the acid water dissolves the rock and carries away the calcium carbonate in the limestone. When the water reaches the air in the caves, it precipitates the calcium carbonate with which it is loaded in the form of Calcite (Crystallization). That is how the stalactites and stalagmites and other concretions are formed. On the floor the concretion process can also happen as the carbon gas in the water is released (rather like when gas bubbles are released as one shakes a bottle of mineral water). As we pick up the tour route at the beginning of the developed section, leaving the “Salle du Cairn” you will be able to see a multitude of very varied mineral formations which Nature has created in this “fossil” (i.e. through which the river no longer runs) level. (See the diagram on page 15). Roofs, walls and the floor are ornamented and decorated with all sorts of concretions. Among the best known are the famous “Stalactites” (“tite = fall) and Stalagmites (“mite” = rise) which are the most frequently found types of underground concretions. As well as the classic forms, resembling candles or pendants, there is an infinite variety of shapes, depending on the strength of the calcite solution and the caprice of the ground through which it flows. Alongside the first flight of stairs the concretion has even taken the form of a “stalagmitic flow”. The first fistulae (or “macaroni”) appear in the same area; little tubes of 4 – 5 mm diameter, growing at about two to four centimetres per century, formed by crystalline deposits on the periphery of small drops of water “sweating” from the roof. At the top of the spiral stair beautiful drapes or curtains decorate the roof and the walls. Leaving the “Salle Blanche” (the White Chamber) the visitor crosses the “Lac du Mouton” (Sheep Lake), which ought really to be called “Sheep Sump” as it has been drained to allow dry-shod access. Here, and further on, underwater concretions can be found, such as excrescences in the shapes of cauliflowers or bunches of grapes. Many gours (also called “rimstones”) and micro-gours have also formed in this part of the grotto, after the “Grande Colonne” (the Great Column). A stair on the right leads to the “Salle de La Méduse” (the Medusa Chamber) also rich with concretions. 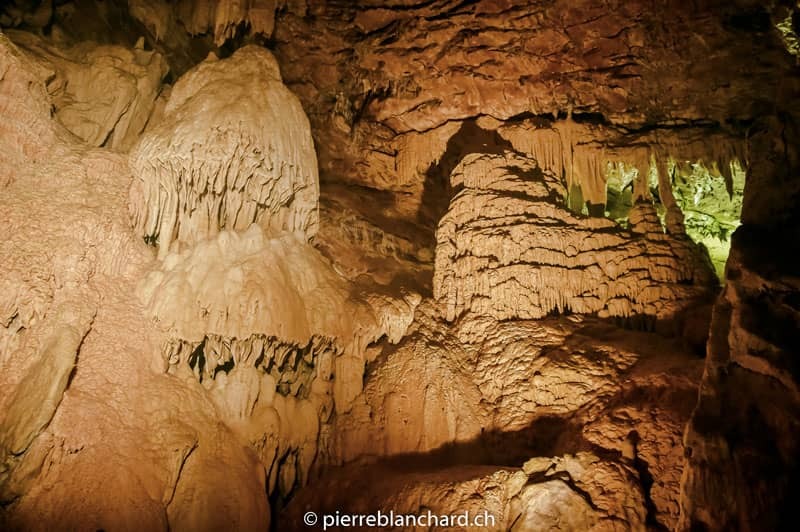 the “Grande Colonne” (the Great Column) at eight metres high is one of the largest concretions in the caves. Very often visitors perceive objects or entities from the outside world in this huge collection of mineral formations. In such places these descriptions are, of course, the products of visitors’ own imagination, whether triggered by a desire for security or from fright. The stone “Bison” protruding on the right is certainly the best example in the whole cave system of such a visual resemblance and bring to mind the live bison which frolic about, some 250M above, in the fields of the Mont d’Orzeires. Descending again towards the river there are still more formations to be seen including the longest fistula in Switzerland – around four metres. 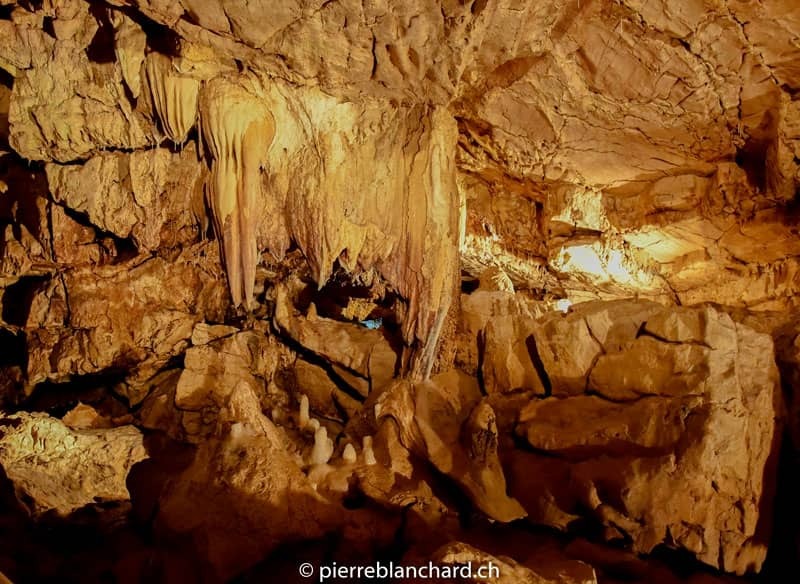 Also to be seen in the caves of the Orbe are the “eccentric concretions” which can grow in filaments or in fine droplets, defying the laws of gravity or – again – the famous “piles of plates” which are caused by drops of water splashing after falling from a great height. There is regular TV and press coverage of the Vallorbe caves. 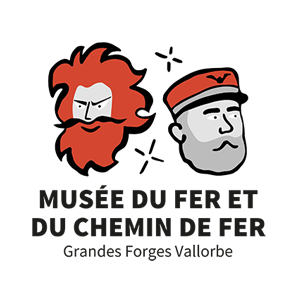 See all the press articles and videos here. 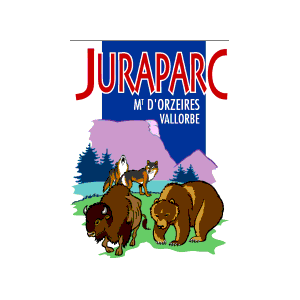 Find exclusive offers on the Vallorbe Caves Facebook page, as well as exclusive offers and extra information.